Venkatesh, D.N., et al. Current Concept and Future Perspectives on Study of Diabetes Neuropathy. (2017) J Pharm Pharmaceutics 4(1): 123- 127. Diabetic neuropathy (DN) is a major cause for blindness. Worldwide it accounts for one type of blindness in the developing country. We have deal with modifying risk factors, genetics, and treatment of DN. Special focus is placed on the rationale and effectiveness of therapeutic modalities, both current and future. Diabetic neuropathy (DN) is a debilitating consequence of diabetes that may be present in as many as one in five patients with diabetes. The objective assessment of DN is difficult, making it challenging to diagnose and assess in both clinical practice and clinical trials. No single treatment exists to prevent or reverse neuropathic changes or to provide total pain relief. Treatment of DN is based on three major approaches: intensive glycemic control, risk factor management and also correlate with genetics configuration where amitriptyline and duloxetine used as antidepressants for pain relief in DN. There is a growing need for studies to evaluate the most potent drugs or combinations for the management of DN to maximize pain relief and improve quality of life. A number of agents are potential candidates for future use in DN therapy, including Nav 1.7 antagonists, N-type calcium channel blockers, NGF antibodies and angiotensin II type 2 receptor antagonists. Diabetic neuropathy has been defined as the presence of symptoms and/or signs of peripheral nerve dysfunction in diabetics after exclusion of other causes (e.g. hereditary, traumatic, compressive, metabolic, toxic, nutritional, infectious, immune mediated, neoplastic and secondary to other systemic illnesses). Peripheral neuropathy is characterized by diffuse damage to the peripheral nerve fibers. Chronic diabetes mellitus is associated with various complications such as retinopathy, neuropathy, nephropathy, cardiomyopathy, vasculopathy, dermatopathy and encephalopathy. DPN as a ‘symmetrical, length-dependent sensorimotor polyneuropathy attributable to metabolic and micro- vessel alterations resulting from chronic hyperglycemia and cardiovascular risk covariates. Diabetic sensorimotor polyneuropathy (DSPN), the most common type of diabetic or disease which happens in the outside of brain or spinal cord. It can effect on both feeling and also in cause movement. Diabetic neuropathy (DN) is one of the common complications of diabetes, affecting more than 60% of diabetes patients worldwide. Inflammation is one of the major reasons behind various deficits in DN. Diabetic peripheral neuropathy (DPN) is characterized by pain, paraesthesia, and sensory loss with considerable morbidity, mortality and diminished quality of life. Painful symptoms such as burning, tingling (‘pins and needles’ or paraesthesia), shooting (like electric shock) or lancing (stabbing) are present in around one third of patients with DPN. The symptoms of painful diabetic neuropathy (DN) can be debilitating and can cause sleep disturbances, anxiety and interfere with physical functioning. DN represents an ongoing therapeutic challenge for patients and caregivers and it is thought that as many 39% of cases of DN may be untreated. Guidelines have been developed by professional organizations to provide a rational approach to the treatment of DN. In this review, we seek to estimate the main therapeutic approaches for DPN and provide insights into future management options. This has become one of the most hot and sensational disease in India. Additionally, 16 – 34% of patients with diabetes report painful neuropathic symptoms and the prevalence is greater in type 2 diabetes, women and South Asian. According to the survey within 2020 it will undertake one patient in each family. 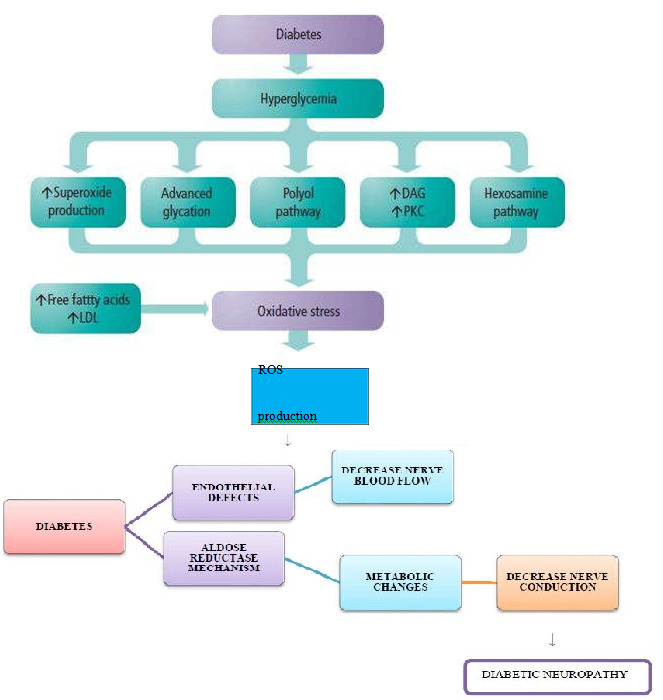 Figure 1: Pathophysiology of Diabetic Neuropathy. Longer nerve fibers are affected to a greater degree than shorter ones because nerve conduction velocity is slowed in proportion to a nerve’s length. In this syndrome, decreased sensation and loss of reflexes occurs first in the toes on each foot, and then extends upward. It is usually described as a glove-stocking distribution of numbness, sensory loss and dysesthesia and night time pain. The pain can feel like burning, pricking sensation, achy or dull. A pins and needles sensation is common. Loss of proprioception, the sense of where a limb is in space, is affected early. These patients cannot feel when they are stepping on a foreign body, like a splinter, or when they are developing a callous from an ill-fitting shoe. Consequently, they are at risk of developing ulcers and infections on the feet and legs, which can lead to amputation. Similarly, these patients can get multiple fractures of the knee, ankle or foot, and develop a Charcot joint. Loss of motor function results in dorsiflexion, contractures of the toes, loss of the interosseous muscle function that leads to contraction of the digits, so-called hammer toes. These contractures occur not only in the foot but also in the hand where the loss of the musculature makes the hand appear gaunt and skeletal. The loss of muscular function is progressive. The autonomic nervous system is composed of nerves serving the heart, lungs, blood vessels, bone, adipose tissue, sweat glands, gastrointestinal system and genitourinary system. Autonomic neuropathy can affect any of these organ systems. The most commonly recognized autonomic dysfunction in diabetics is orthostatic hypotension, or fainting when standing up. In the case of diabetic autonomic neuropathy, it is due to the failure of the heart and arteries to appropriately adjust heart rate and vascular tone to keep blood continually and fully flowing to the brain. This symptom is usually accompanied by a loss of respiratory sinus arrhythmia - the usual change in heart rate seen with normal breathing. These two findings suggest autonomic neuropathy. GI tract manifestations include gastroparesis, nausea, bloating, and diarrhea. Because many diabetics take oral medication for their diabetes, absorption of these medicines is greatly affected by the delayed gastric emptying. This can lead to hypoglycemia when an oral diabetic agent is taken before a meal and does not get absorbed until hours or sometimes days later when there is normal or low blood sugar already. Sluggish movement of the small intestine can cause bacterial overgrowth, made worse by the presence of hyperglycemia. This leads to bloating, gas and diarrhea. When cranial nerves are affected, neuropathies of the oculomotor nerve (cranial nerve #3) are most common. The oculomotor nerve controls all the muscles that move the eye except for the lateral rectus and superior oblique muscles. It also serves to constrict the pupil and open the eyelid. The onset of diabetic third nerve palsy is usually abrupt, beginning with frontal or periorbital pain and then diplopia. All the oculomotor muscles innervated by the third nerve may be affected, but those that control pupil size are usually well-preserved early on. This is because the parasympathetic nerve fibers within CNIII that influence pupillary size are found on the periphery of the nerve (in terms of a cross-sectional view), which makes them less susceptible to ischemic damage (as they are closer to the vascular supply). The sixth nerve, the abducens nerve, which innervates the lateral rectus muscle of the eye (moves the eye laterally), is also commonly affected but fourth nerve, the trochlear nerve, (innervates the superior oblique muscle, which moves the eye downward) involvement is unusual. Mononeuropathies of the thoracic or lumbar spinal nerves can occur and lead to painful syndromes that mimic myocardial infarction, cholecystitis or appendicitis. Diabetics have a higher incidence of entrapment neuropathies, such as carpal tunnel syndrome. Diabetic neuropathy affects all peripheral nerves including pain fibers, motor neurons and the autonomic nervous system. It, therefore, can affect all organs and systems, as all are innervated. There are several distinct syndromes based on the organ systems and members affected, but these are by no means exclusive. A patient can have sensorimotor and autonomic neuropathy or any other combination. Signs and symptoms vary depending on the nerve(s) affected and may include symptoms other than those listed. Symptoms usually develop gradually over years. Despite these proven treatments for retinal complications of diabetes, patients with diabetic retinopathy continue to experience visual loss. A number of off-label non-FDA approved treatment modalities are currently in clinical use and/or are under investigation for the treatment of various aspects of DR.
A large number of placebo-controlled RCTs have found tricyclic antidepressants (TCAs) to be efficacious for several different types of NP. TCAs were introduced in the late 1950s and it is the most studied class of a drug along with their analgesic efficacy for Painful Diabetic Neuropathy. Amitriptyline was the first TCA to be studied in 1977 which were a serotonin and noradrenaline reuptake inhibitors. Amitriptyline has been a first-line treatment for Neuropathic Pain for many years. Other TCAs include Imipramine which is also a serotonin and noradrenaline reuptake inhibitor and it block a- adrenergic, H1- histamine, muscarinic cholinergic, and N-Methyl-D-aspartate receptors. Imipramine has been studied in six placebo-controlled trials[4-7]. TCAs used to treat PDN. They are also inexpensive and convenient to give due to single daily dosing. Dry mouth, orthostatic hypotension, urinary retention, constipation are the adverse effects for anticholinergic. Initial by low doses of TCA which decrease the adverse effects. Patients with an ischemic cardiac disease or ventricular conduction abnormalities TCA is provide in the prescription for the cause of cardiac toxicity with TCA, usually dose limiting with below of 100 mg/day, for geriatric patients ECG are performed. Adequate pain relief with TCA occurred within two to three months of duration. For the treatment of major depressive disorders and management of neuropathic pain associated with diabetic Duloxetine is a balanced serotonin disorders. The usual dose of Duloxetine is 60 mg. Duloxetine help to reduce for both painful diabetic peripheral neuropathy and fibromyalgia. Duloxetine improves the magnitude of effect in diabetic peripheral neuropathy. Through an improvement in mental symptoms than in somatic pain relief, the effect of fibromyalgia. Duloxetine has shown consistent efficacy in DPN with 1-year effectiveness in an open-label trial[9,10] it was concluded that in patients with DPN inadequately treated with gabapentin without the concomitant use of antidepressants, switching to duloxetine instead of pregabalin might provide better pain reduction also emphasize that in non respondents to gabapentin who were concomitantly using Antidepressants, get pain reduction by tune to Duloxetine with Pregabalin give synergies effect. Duloxetine has been effective in treating depression, and anxiety disorder with 60 mg of daily dosing. Adverse effect of Duloxetine can be decreased by enhancing from 30 to 60 mg in daily once. On ECG and blood pressure there is no effect cause by Duloxetine and a last review assured by aminotransferase monitoring is unnecessary. Venlafaxine has shown efficacy in painful DPN and painful polyneuropathies of all origins. It requires 2 to 4 weeks to titrate effective dosage (i.e., 150 - 225 mg/d). It is available in short- and long-acting preparations. With few members of patients, Venlafaxine can make cardiac conduction abnormalities, side by side it also enhance blood pressure. Therefore for pulmonary heart disease patients more consciousness should be bring while prescription of Venlafaxine. Furthermore, the drug cannot be instantly stop but it can be reduce due to the withdrawal syndrome risk. For the treatment of macular edema, including DME periocular and intraocular of triamcinolone acetonide generally used. This effect may be most pronounced in cases of cystoid macular edema (CME) or diffuse macular edema recalcitrant to laser therapy. A small randomized prospective clinical trial showed a beneficial effect of intravitreal TA) with diffuse DME were randomized to receive a single 20 mg intravitreal TA or sham injection at 3 and 6 months, maximum of the eyes in the TA group had greater than a 2 line improvement in visual acuity versus less than 30% in the control group. A benefit was also seen in a randomized, controlled prospective trial of intravitreal TA for refractory DME with two-year follow-up. Participants in both groups were eligible to receive focal photocoagulation if deemed necessary. A prospective trial comparing intravitreal TA to macular grid photocoagulation for the treatment of CME showed that TA was more effective than focal laser in this setting for patients the group receiving both TA and photocoagulation was similar to TA alone. For the potent effect of focal or panretinal photocoagulation, minimization of development, macular edema progress the Triamcinolone is found to be used as an adjunctive treatment for familial multiple lipomatosis or Pityriasis Rubra Pilaris. The clear benefits of steroid therapy these must be judged against significantly. Carbonic anhydrase I was recently identified as 117 proteins upregulated in vitreous samples of eyes with proliferative diabetic retinopathy using an unbiased, mass spectroscopy-based proteomic analysis. In an animal model, carbonic anhydrase I increased retinal vascular leakage and retinal thickness through a kallikrein and bradykinin-dependent pathway. Acetazolamide, a carbonic anhydrase inhibitor, is widely used for treatment of glaucoma and cystoid macular edema in the setting of retinitis pigmentosa. In a small pilot case-control study of diabetics, oral acetazolamide improved angiographic edema, but had an equivocal benefit t for visual acuity. Further study is needed to validate the biological and clinical importance of this pathway in DR and DME. Benfotiamine, a thiamine derivative, inhibits three biochemical pathways of hyperglycemia-induced endothelial dysfunction, namely the hexosamine, AGE formation, and diacylglycerol-PKC pathways. When administered to streptozocin-treated diabetic rats, benfotiamine decreased capillary changes from diabetic retinopathy. This treatment modality is currently under investigation for treatment of diabetic peripheral neuropathy and holds promise in the prevention of DR. The painful medications of diabetic neuropathy that is expected to be affected by the medication were avoided except acetaminophen, aspirin and SRI. The drugs affecting Central Nervous System for example TCAs, valsartan, and chlorpromazine were avoided during the course of experiment. Now in clinical trials: Two treatments that might be useful in opposing some of the pathogenic factors that are thought to lead to neuropathy are now in clinical trials. α - lipoic-acid: The antioxidant lipoic acid (600 mg/day) administered I.V helps to reduce the pain management for neuropathy. An optimum improvement in case of neuropathic pain was observed through meta-analysis with the treatment of lipoic acid at a dose of 600 mg per day for a period of 3 weeks. Oral treatment with a-lipoic acid for 5 weeks improved neuropathic symptoms and deficits in patients with DPN. Protein kinase C inhibition: It is expected that an increase level of protein kinase C is a prime factor of diabetic micro vascular complications. Studies that used protein kinase C β-inhibitor showed improved symptoms of allodynia and prickling pain. Daily oral dose of gabapentin: nortriptyline or their combinations were more effective on patients with DPN. The combination of Morphine and Gabapentin showed superior effect in neuropathic pain with same adverse effect compared to its monotherapy in parallel group study of patients. Targeting the transient receptor potential (TRP) channel (TRPV1) by capsaicin on nociceptive neurons has proved an effective strategy for DN. DPN, being the most important underlying causes for neuropathic pain, remain a challenging condition to manage and despite several well-designed recent trials looking at slowing the progressive decline in nerve function associated with DPN, no novel treatment has emerged. This might be due to multi factorial etiology and treatment targeting single pathway. As of today TCAs, Gabapentin/pregabalin remain the first line therapy drugs, keeping in mind the role of duloxetine/ lacosamide for better pain management. DN is common and is associated with significant impairment in the quality of life of patients with diabetes. Despite its high burden, it remains under diagnosed and undertreated. Treatment which repairs nerves has yet to be found and translated into clinical trials and eventually approved therapy in clinical practice. Whilst a number of treatment options exist and various guidelines and algorithms have been formulated, none are satisfactory. Various symptomatic treatments have been proposed to manage neuropathic pain but few have been found to be effective, with only three medications currently FDA approved for DN. Future research must establish the most efficacious drug combinations and in addition exploit new mechanisms and investigate new drugs for the treatment of diabetic neuropathy. 1. Tugnoli, V., Capone, J.G., Eleopra, R., et al. Botulinum toxin type A reduces capsaicin-evoked pain and neurogenic vasodilatation in human skin. (2007) Pain 130(1-2): 76-83. 2. Davis, J.L., Lewis, S.B., Gerich, J.E., et al. Peripheral diabetic neuropathy treated with amitriptyline and fluphenazine. (1977) JAMA 238(21): 2291-2292. 3. Sindrup, S.H., Otto, M., Finnerup, N.B., et al. Antidepressants in the treatment of neuropathic pain. (2005) Basic Clin Pharmacol Toxicol 96(6): 399-409. 4. Kvinesdal, B., Molin, J., Froland, A., et al. Imipramine treatment of painful diabetic neuropathy. (1984) JAMA 251(13): 1727-1730. 5. Young, R.J., Clarke, B.F. Pain relief in diabetic neuropathy: the effectiveness of imipramine and related drugs. (1985) Diabet Med 2(5): 363-366. 6. Sindrup, S.H., Ejlertsen, B., Froland, A., et al. Imipramine treatment in diabetic neuropathy: relief of subjective symptoms without changes in peripheral and autonomic nerve function. (1989) Eur J Clin Pharmacol 37(2): 151-153. 7. Sindrup, S.H., Bach, F.W., Madsen, C., et al. Venlafaxine ersus imipramine in painful polyneuropathy: a randomized, controlled trial. (2003) Neurology 60(8): 1284-1289. 8. Dworkin, R.H., O’Connor, A.B., Backonja, M., et al. Pharmacologic management of neuropathic pain: evidence-based recommendations. (2007) Pain 132(3): 237-251. 9. Raskin, J., Smith, T.R., Wong, K., et al. Duloxetine versus routine care in the long-term management of diabetic peripheral neuropathic pain. (2006) J Palliat Med 9(1): 29-40. 10. Tanenberg, R.J., Clemow, D.B., Giaconia, J.M., et al. Duloxetine compared with pregabalin for diabetic peripheral Neuropathic Pain management in patients with suboptimal pain response to Gabapentin and treated with or without Antidepressants: A post Hoc Analysis. (2014) Pain Pract 14(7): 640-648. Doi: 10.1111/ papr.12121. 11. Wernicke, J., Lledó, A., Raskin, J., et al. An evaluation of the cardiovascular safety profile of duloxetine: findings from 42 placebo controlled studies. (2007) Drug Saf 30(5): 437-455. 12. McIntyre, R.S., Panjwani, Z.D., Nguyen, H.T., et al. The hepatic safety profile of duloxetine: a review. (2008) Expert Opin Drug Metab Toxicol 4(3): 281-285. 13. Rowbotham, M.C., Goli, V., Kunz, N.R., et al. Venlafaxine extended release in the treatment of painful diabetic neuropathy: a double blind, placebo controlled study. (2004) Pain 110(3): 697-706. 14. Hamza, M.A., White, P.F., Craig, W.F., et al. Percutaneous electrical nerve stimulation: a novel analgesic therapy for diabetic neuropathic pain. (2000) Diabetes Care 23(3): 365-370. 15. Ziegler, D., Nowak, H., Kempler, P., et al. Treatment of symptomatic diabetic polyneuropathy with the antioxidant alpha-lipoic acid: a meta-analysis. (2004) Diabetic Med 21(2): 114-121. 16. Ziegler, D., Ametov, A., Barinov, A., et al. Oral treatment with a lipoic acid improves symptomatic diabetic polyneuropathy-The SYDNEY 2 trial. (2006) Diabetes Care 29(11): 2365-2370. 17. Litchy W, Dyck P, Tesfaye S. For the MBBQ Study Group: Diabetic peripheral neuropathy (DPN) assessed by neurological examination and composite scores is improved with LY333531 treatment (Abstract) (2002) Diabetes.45: A197. 18. Weintraub, M.I., Wolfe, G.I., Barohn, R.A., et al. Static magnetic field therapy for symptomatic diabetic neuropathy; a randomized, double-blind, placebo controlled trial. Arch Phys Med Rehabil. 2003; 84(5): 736-46.